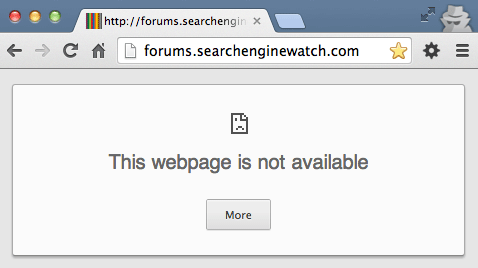 Last night, I stopped by the old Search Engine Watch Forums, which launched just under ten years ago and I noticed it was offline. I thought maybe it was a hiccup and I'd try back in the morning. But it still seems to be offline. The forums launched in June 2004 under the original leadership of Danny Sullivan and the Search Engine Watch team. Slowly over the years, the forum has died out. Forums in general are competing against social networks like Facebook, Twitter, LinkedIn, Google+ and others. So for forums to survive these days, it takes a lot of effort. It still might be a hiccup as to why the forums are offline but I suspect it was a conscious decision to take them down. Update: About 24 hours later, the site is back online.